With federal contracting opportunities come a host of compliance requirements companies must be aware of. These laws are mandated by the Office of Federal Contract Compliance Programs (OFCCP). Divisions of companies and subcontractors are many times subject to the same compliance requirements imposed upon direct contractors. Likewise, subcontractors and other divisions of a company oftentimes need to implement Affirmative Action Plans (APP). The LaborLawCenter™ understands the questions and concerns that may arise as a result of your contracting compliance regulations. For your convenience, we provide the resources, products, and FAQ below to address your questions on your most complex contracting and subcontracting scenarios. All of our Federal Contractor products have been updated to reflect 2019 compliance requirements. Need more information about Federal Contractor postings? Click here to read more on what Federal contractors or subcontractors must do to be in compliance. Federal contractors and their subcontractors are required to post the notice titled Employee Rights Under The National Relations Act (NLRA). Federal contractors need to post the required employee notice and also insert provisions in their subcontracts that require their subcontractors to post the employee notice as well. This poster includes multiple mandatory posting requirements on a single poster. For some postings, appropriate contract sanctions may be imposed for uncorrected violations. 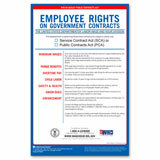 In addition to the regular labor law posters, Federal contractors and subcontractors are mandated to comply with other compliance requirements that may be in the form of poster, posting of notice, or alternate formats. All Federal contractors and subcontractors should consider the Complete Federal Contractors Package, to ensure they have all compliance requirements met. The penalty amount or consequences of non-compliance for Federal contractors and subcontractors vary depending on the offense. Any federal contractor or subcontractor engaged in contracts that are greater than $2,000 for construction, alteration, or repair of a public building or works financed (in whole or in part) from federal funds, federal guarantee, or federal pledge are subject to the labor standards provisions listed in 29 CFR 5.1. No citations or penalties for failure to post. Federal contractors and subcontractors are required to post the in offices where employees covered by the NLRA perform contract-related activity, including all places where notices to employees are customarily posted, both physically and electronically. The sanctions, penalties, and remedies for noncompliance include the suspension or cancellation of the contract, as well as debarring from future federal contracts. The Act requires contractors and subcontractors performing services on prime contracts of more than $2,500 to pay service employees in various classes no less than the wage rates and fringe benefits found prevailing in the locality, or the rates (including prospective increases) contained in a predecessor contractor's collective bargaining agreement. 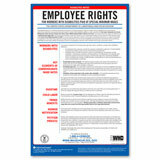 Any covered employer failing to post the poster may be subject to citation and penalty. 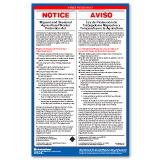 Each farm labor contractor, agricultural employer and agricultural association that is subject to MSPA, and that employs migrant or seasonal agricultural worker is required to post a poster explaining the rights protected under MSPA. A civil money penalty may be assessed. Every employer having workers employed under special minimum wage certificates authorized by section 14(c) of the Fair Labor Standards Act. 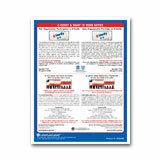 Any business, real estate broker, agent, salesman, or person in the business of residential real estate or related real estate transactions are required to post the Fair Housing Poster. 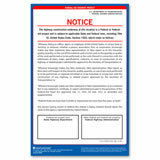 Failure to post the Fair Housing Poster as required by law, might be considered as a discriminatory housing practice. Any business that uses the e-verify system during its employment verification process either voluntarily or through a State/Federal mandate must post the notice to inform employees that the system is used at the company and to inform them of their rights. Any covered employer who fails to post may be subject to citations or penalties. In compliance with Executive Order 13495, all contractors and subcontractors awarded a federal service contract to provide the same or similar services at the same location must, in most circumstances, offer employment to the predecessor contractor's employees in positions for which they are qualified. The predecessor contractor must provide written notice to all eligible employees. 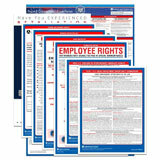 Under EEOC posting guidelines, all federal contractors must provide alternate formats of the “EEO is the Law” poster to both employees and applicants. 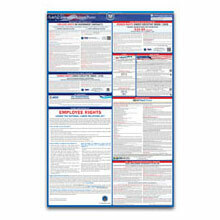 The EEOC Large Print Poster is a recommended alternate format. No citations or penalties for failure to display this poster. 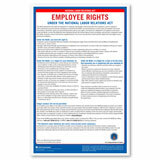 However federal contractors that fail to provide an alternate format, such as the EEOC Large Print Poster, will be subject to citations and penalties. 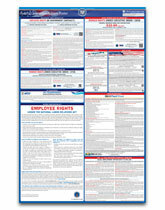 All federal contractors must make the “EEO is the Law” poster available in alternate formats for employees and applicants. An alternate format recommended by the federal government is Braille for the visually impaired. Federal contractors will not face citations or penalties for not having the EEOC Braille booklet. 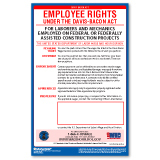 However contractors will be subject to citations and penalties if they do not provide alternate formats of the “EEO is the Law” poster. 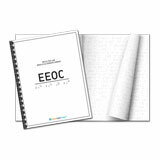 The EEOC Braille Booklet satisfies the alternate format EEOC posting requirement. 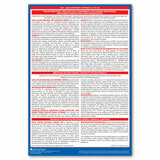 Federal contractors, under EEOC posting guidelines, must make available alternate formats of the “EEO is the Law” poster to employees and applicants. 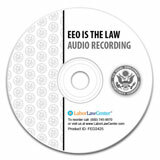 A recommended alternate format is an audio recording of the “EEO is the Law” poster. Federal contractors are not required to have an audio recording of the EEOC poster, however failure to provide an alternate format of the poster to employees and applicants can result in citations or penalties. The EEOC Audio Recording meets the alternate format requirement. How do I know if I am a federal contractor or subcontractor who is required to comply with OFCCP laws? Please note that the dollar amount and nature of the federal contracts will determine the OFCCP obligations. In general, all of a business’ establishments will be under OFCCP jurisdiction, even if the contract will be exercised at only one of the business’ facilities. Which federal contracts or subcontracts are exempt from Section 503? (http://www4.law.cornell.edu/uscode/29/793.html), is administered by OFCCP. Section 503 requires employers with federal contracts or subcontracts that are greater than $10,000, and contracts or subcontracts for indefinite quantities (unless it is believed the cost in any one year will not be greater than$10,000), to take affirmative steps. • For work that is performed outside the U.S.
Are all construction contractors and subcontractors affected by OFCCP laws? Contractors and subcontractors who have federal or federally-assisted contracts of $10,000.00 or more are subject to OFCCP laws depending on contract amount. After the determination of OFCCP jurisdiction has been made, the OFCCP civil rights requirements will apply to all of the contractor’s or subcontractor’s employees on the construction site. Am I required to determine if my suppliers and vendors maintain an APP? You are not required to determine if vendors or suppliers have developed and maintained written AAPs. You are however, required to include the Equal Opportunity (EO) clause in each subcontract or purchase order. Our specific division doesn’t do any government work; this is handled by other divisions within our company. Do we still fall under OFCCP laws? Yes. In general, once a determination has been made on civil rights requirements for a business, then all of the organization’s establishments and facilities will be subject to the regulations, regardless of federal contract location. A business or organization does not have to meet all five factors to be considered a single entity. What records should a federal contractor or subcontractor be keeping? Contractors with less than 150 employees, or those who do not have a government contract of at least $150,000 only need to keep records for one year from the record date or the action involved, whichever occurs later. Is a hospital or other health care provider covered under the laws enforced by OFCCP? Hospitals can receive reimbursements for medical services provided to federal employees, retirees, or their dependents from a health insurance carrier that participates in the Federal Employee Health Benefits Program (FEHB). OFCCP's policy is that the receipt of reimbursements from a health insurance carrier that provides a health benefits plan under the FEHB Program, for the medical services provided to Federal employees or their dependents, will not subject the health care provider to the laws enforced by OFCCP. This policy is based on the decision of DOL's Administrative Review Board (ARB) in OFCCP v. Bridgeport Hospital, ARB Case No. 00-234, (January 31, 2003). Our business is a fund depository, and an issuing and paying agent for U.S. Saving Bonds and savings notes. Are we required to implement the Affirmative Actions Program (AAP) requirements under Executive Order (E.O.) 11246, as amended, the Vietnam Era Veterans' Readjustment Assistance Act of 1974 (VEVRAA), as amended, 38 U.S.C. 4212 and Section 503 of the Rehabilitation Act of 1973 (Section 503), as amended? The E.O. 11246 implementing regulations at 41 CFR 60-1.40(a) and 60-2.1(b) state, that any non-construction contractor that serves as a depository of government funds in any amount or a financial institution which is an issuing and paying agent for U.S. saving bonds and saving notes in any amount must develop an affirmative action program: http://www.dol.gov/dol/allcfr/ESA/Title_41/Part_60-1/41CFR60-1.40.htm. Section 503 states a government contractor with 50 or more employees and a government contract of $50,000 or more must develop a Section 503 affirmative action program. 41 CFR 60-741.40(a). The Section 503 regulations define a Government contract as "any agreement or modification thereof between any contracting agency and any person for the purchase, sale or use of personal property or nonpersonal services." 41 CFR 60-741.2(i). The term "nonpersonal services" as used in this section includes fund depository. 41 CFR 60-741.2(i)(4). Thus, the agreement to serve as a Federal funds depository is a "Government contract." See http://www.dol.gov/dol/allcfr/ESA/Title_41/Part_60-741/41CFR60-741.2.htm. Under Section 503, however, all government contracts must exceed the $50,000 for coverage. Thus, if you serve as a depository for Federal funds of $50,000 or more, or have an agreement valued at $50,000 or more to be an issuing and paying agent for savings bonds and notes, you would therefore need to develop and maintain a Section 503 affirmative action program. In addition, it is the same case for VEVRAA as under Section 503 for any Government contractor with 50 or more employees and a contract of $50,000 or more to serve as a depository of Federal funds or as an issuing and paying agent for savings bonds and notes, if the Government contract was entered into before December 1, 2003. See http://www.dol.gov/dol/allcfr/ESA/Title_41/Part_60-250/41CFR60-250.40.htm. The Jobs for Veterans Act (JVA) amended VEVRAA, however, raise the dollar threshold amount required for contract coverage to $100,000. The new amount applies to contracts entered on or after December 1, 2003. Thus, if your business or organization became a fund depository or an issuing and paying agent for savings bonds and notes on or after December 1, 2003, it would also be subject to the written AAP requirement under VEVRAA if the contract is for $100,000 or more. Is a covered Federal Deposit Insurance Corporation (FDIC) financial institution coverage subject to the Affirmative Actions Program (AAP) requirements under Executive Order 11246, as amended, the Vietnam Era Veterans' Readjustment Assistance Act of 1974 (VEVRAA), as amended, 38 U.S.C. 4212 and Section 503 of the Rehabilitation Act of 1973 (Section 503), as amended? FDIC Financial institutions are considered to be government contractors and subject to implementing Executive Order 11246, as amended, the Vietnam Era Veterans' Readjustment Assistance Act of 1974 (VEVRAA), as amended, 38 U.S.C. 4212 and Section 503 of the Rehabilitation Act of 1973 (Section 503), as amended. These three OFCCP programs require equal employment opportunity by government contractors. The regulations for Executive Order 11246 (41 CFR 60-1.3), define a government contract as any agreement or modification between any contracting agency and any person for the purchase, sale or use of personal property or nonpersonal services. The term "nonpersonal services" as used in this section includes, but is not limited to, the following services: utilities, construction, transportation, research, insurance, and fund depository. The definition includes agreements for insurance: http://www.dol.gov/dol/allcfr/ESA/Title_41/Part_60-1/41CFR60-1.3.htm. The implementing regulations for the VEVRAA and Section 503 programs, 41 CFR 60-250.2 (http://www.dol.gov/dol/allcfr/ESA/Title_41/Part_60-250/41CFR60-250.2.htm) and 60-741.2 (http://www.dol.gov/dol/allcfr/ESA/Title_41/Part_60-741/41CFR60-741.2.htm) respectively, also define a government contract as any agreement or modification thereof between any contracting agency and any person for the purchase, sale or use of personal property or nonpersonal services. The term "nonpersonal services" as used in this section includes, but is not limited to, the following services: utilities, construction, transportation, research, insurance, and fund depository. This definition also includes agreements for insurance. Thus, financial institutions with federal share and deposit insurance are considered to be government contractors.